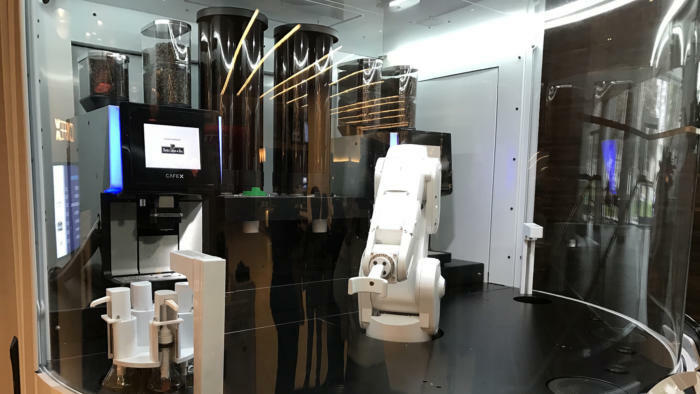 The robotic arm manning Cafe X at the Metreon shopping center in San Francisco looks very caffeinated as it frantically swings from one side of its enclosed bar to the other. 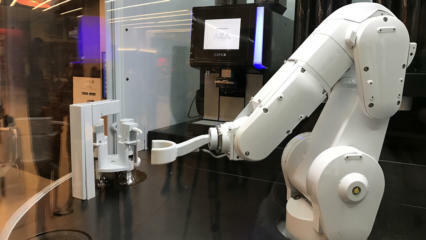 Along with the help of two fully automatic coffee machines, the arm can whip up anywhere from one to four drinks a minute, depending on the complexity of the order. Customers can place an order either by using the company's smartphone app or through one of the kiosks at the cafe. Once their order is ready, customers receive a four-digit code, which they use to pick up their drink. Efficiency is key. "In today's world, you have two options for getting a cup of coffee: you're either in and out with something subpar, or you're waiting in a 15-minute line for a great cappuccino," said Cafe X CEO Henry Hu. "I started Cafe X to eliminate that inherent compromise and give people access to a tasty cup of coffee consistently and conveniently." Hu started Cafe X in 2014 after realizing that a lot of the work baristas currently do is repetitive and could be done by a robot. So he dropped out of college, sold his car, and raised some convertible notes from family and friends before getting backing from a number of venture capitalists, including Khosla Ventures, Social Capital, and Jason Calacanis. Besides efficiency, Cafe X prides itself on quality coffee. The shop serves beans from specialty roasters AKA Coffee, Verve, and Peet's. Each roaster programs the coffee machines to their own recipes to ensure the same taste wether the coffee comes from a human or bot. Cafe X's robotic barista at the Metreon in San Francisco on Jan. 2, 2017. Cafe X originally debuted in a Kong Kong office building a few months ago. Hu says that location currently serves more than 1,000 drinks a week. Though he would not disclose how much the setup cost, Hu did say that it's about the same price as renovating and opening a traditional cafe. "At this point, we don't have too much cost savings. We are more focused on just giving people a good experience."